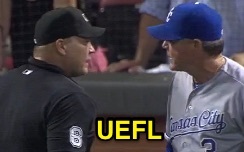 HP Umpire Mark Carlson ejected Royals Manager Ned Yost for arguing a Replay Review decision that affirmed 3B Umpire Eric Cooper's out call in the top of the 11th inning of the Royals-Reds game. With none out and none on, Royals batter Alcides Escobar hit a 3-2 fastball from Reds pitcher Jumbo Diaz on a line drive to center fielder Billy Hamilton, who threw to shortstop Eugenio Suarez as Escobar slid into second base, ruled out by Cooper. Upon Replay Review as the result of a challenge by Royals Manager Yost, Cooper's ruling stood, the call was irrecusable. At the time of the ejection, the game was tied, 1-1. The Royals ultimately won the contest, 3-1, in 13 innings. This is Mark Carlson (6)'s second ejection of 2015. Mark Carlson now has 16 points in the UEFL Standings (14 Prev + 2 MLB + 0 Irrecusable Call = 16). Crew Chief Mark Carlson now has 4 points in Crew Division (3 Previous + 1 Correct Call = 4). This is the 166th ejection of the 2015 MLB Regular Season. This is the 78th Manager ejection of 2015. This is the Royals' 12th ejection of 2015, 1st in the AL Central (KC 12; CWS, DET 6; CLE 5; MIN 3). This is Ned Yost's 2nd ejection of 2015, 1st since April 19 (Greg Gibson; QOC = U [Warnings]). This is Mark Carlson's first ejection since June 7, 2015 (Alex Wood; QOC = Y [Balls/Strikes]).